I’m hoping all of you had the happiest of happy Easter’s today. Filled with great worship, those you love, chocolate bunnies… or at least a killer meal. Because it just wouldn’t be Easter without a feast. This last week I realized that I wouldn’t be traveling home to see family and loved ones and decided to plan an Easter celebration lunch with my new friends. Luckily Knife Girl hosted (as my apartment gets a wee bit tiny for a 10 person meal) and everyone brought a dish to share. I was pretty torn between attempting some sort of Quiche and cheesy potato casserole. And people, we can officially deem the fear of the kitchen long gone. Because I had a wonderful time following the recipes and learning to make something new. In fact, I’d almost missed it! 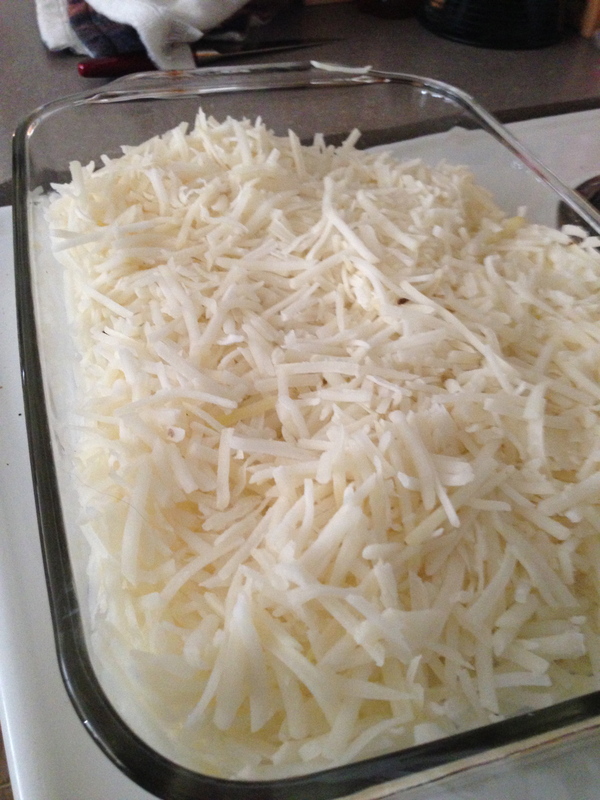 First up… Cracker Barrel Hashbrown Casserole! Thanks to Pinterest I found the recipe on a site that attempts to mimic restaurant recipes. 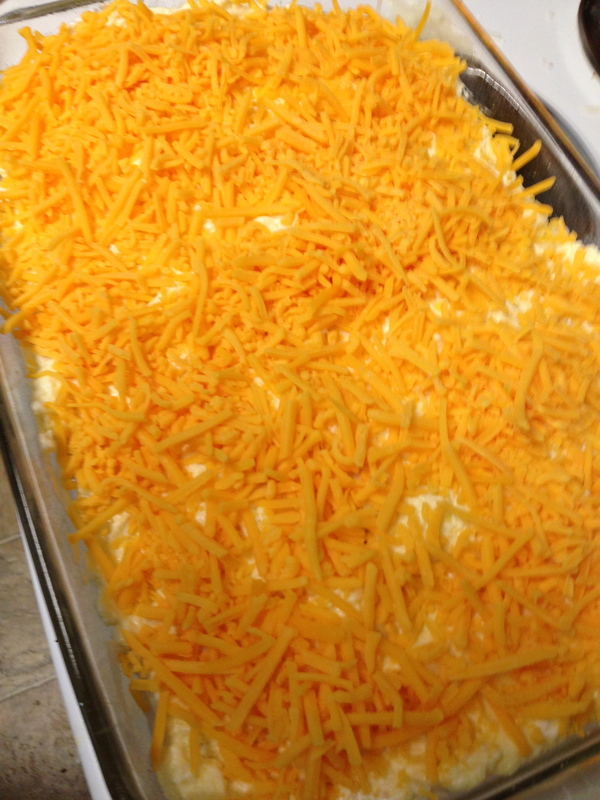 And I’ll tell you, the casserole is great… but I don’t really think it tastes like the cheesy hash browns of Cracker Barrel… Oh and whatever you do… don’t think that you’ll just double this because it doesn’t look like very much. Because this recipe fills a 9×13 pan TO THE BRIM. Place potatoes in a greased 9×13 inch pan. Season with salt and pepper. Melt butter in the microwave. In a bowl add minced onions, sour cream, and cream of chicken soup, and melted butter. Mix these items together. This is the one large bag of potatoes. If you happened to buy a second large bag… bad news bears, looks like you’ll be eating hash browns for breakfast/lunch/dinner for the rest of the week! Yeah. It is that gross. My hint: throw that cream of chicken soup out immediately after you use it. 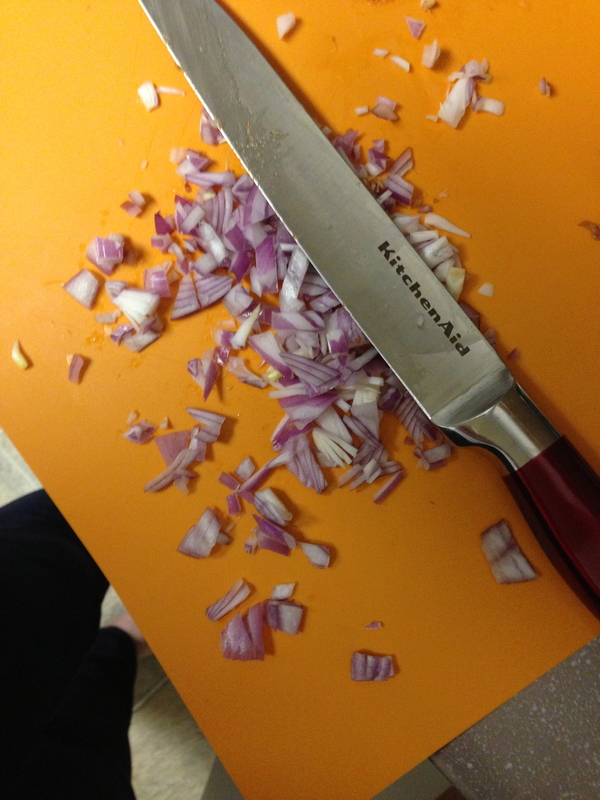 If left in your kitchen – it WILL smell. Whoops. Forgot to take an after, I was apparently just so excited with how it turned out! For the Quiche I found a recipe from good old Martha herself. Almost makes me want to subscribe to the Martha Stewart Living Magazine – because the Sausage Potato Quiche was worth every bite. Preheat oven to 375 degrees F. Lightly flour a rolling-pin and work surface and roll out dough to a 12-inch round. (Again, cute.) Place in a 9-inch pie plate, fold overhang under, and crimp edge. Place a sheet of parchment paper over dough and fill with pie weights or dried beans. Bake until edge is dry and light golden, about 20 minutes. Remove parchment and weights. 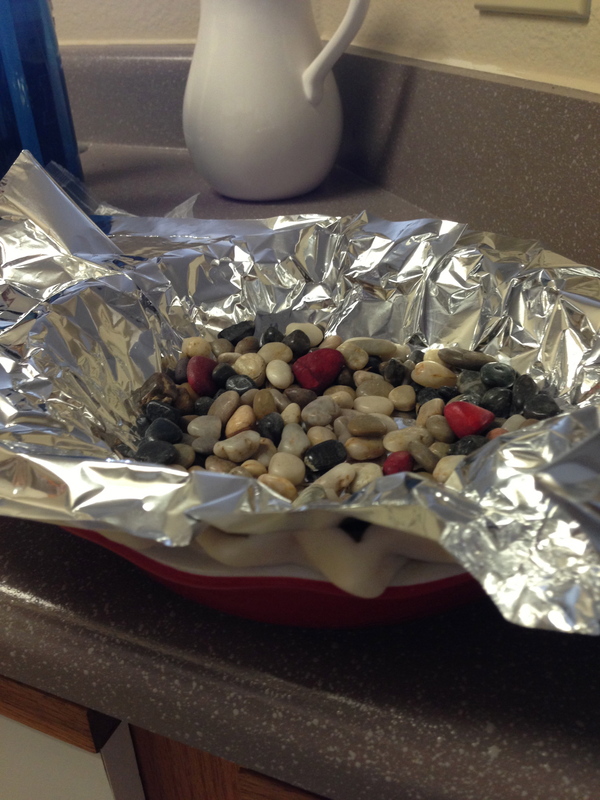 The last time I made a pie, I underestimated the importance of using “pie weights.” This time, I used rocks. I mean, those are weights right?! Meanwhile, in a large skillet, melt butter over medium-high. Add sausage, season with salt and pepper, and cook until light golden, 8 to 10 minutes. 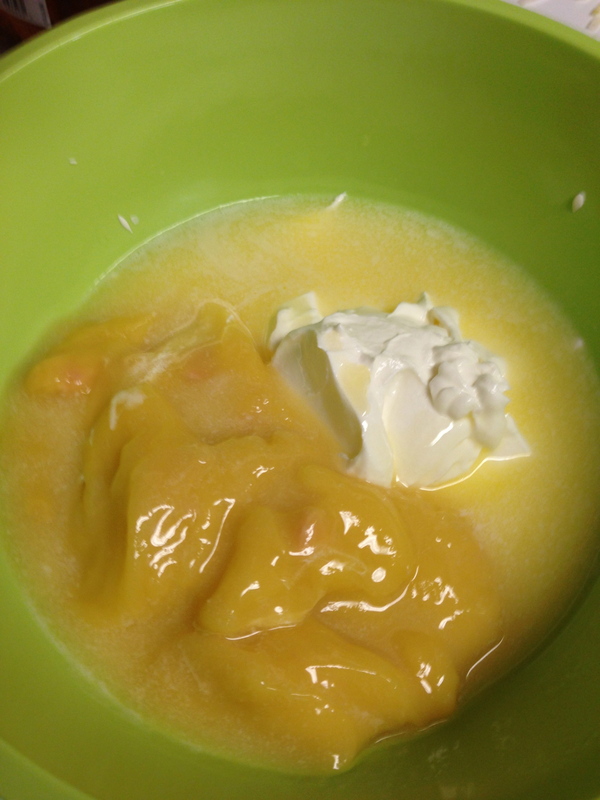 In a medium bowl, whisk together eggs and cream. Add sausage, potato, and cheese and season with 1/2 teaspoon salt and 1/4 teaspoon pepper. 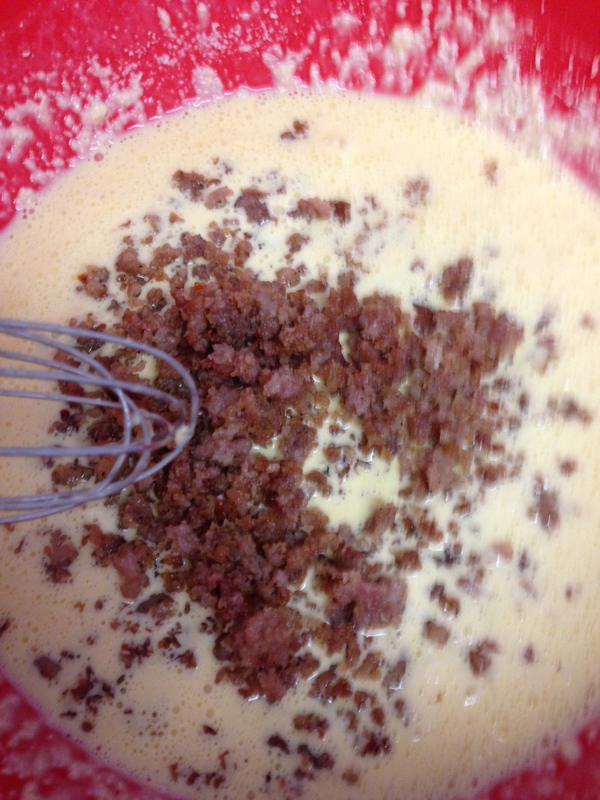 Whisk to combine, pour into crust, and bake until center of Quiche is just set, 40 to 45 minutes. Serve warm or at room temperature. Same as the casserole. Made this last night. Put it in the fridge and then reheated it at 350 degrees for 15 minutes after church. Both dishes got rave reviews. 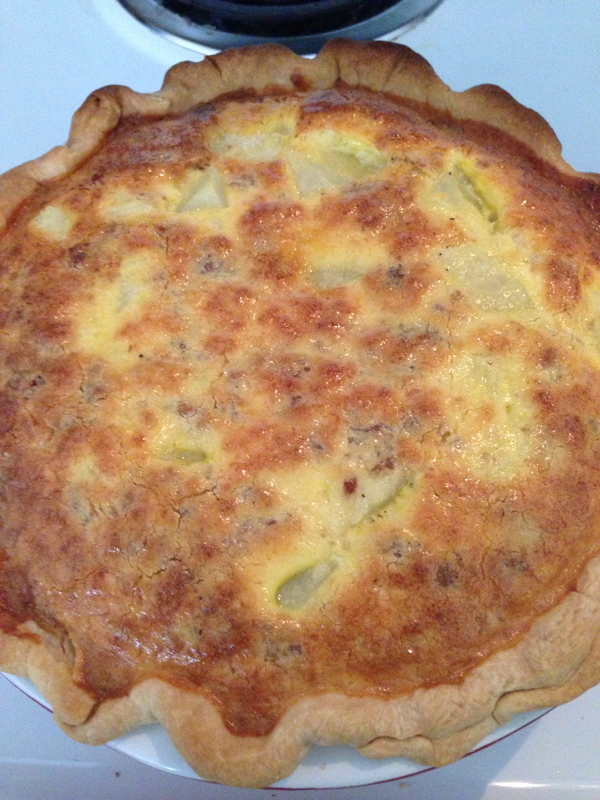 And this Quiche thing. This is happening way more often. It takes maybe 15 minutes of prep time. 40ish minutes of bake time (while you’re doing other things around the house). And then you can eat immediately or keep it for later. How handy! Oh and what do you know, I happen to have enough ingredients for a round two. Looks like I might be re-making this dish sooner than expected! May all of your weeks be filled with happiness! And remember: He is risen indeed! The best part of having a little little brother, is the excuse you have to do the things you used to love when you were a child. So during a quick trip home I stole some family time. And don’t ask me how, but we stumbled upon a conversation about if two people could ride on one bike at a time. So obviously, we got the bike out. And our helmets. And decided to try. I needed one last picture together before one of us smashed our face in. Permanent style. And here’s what we discovered. 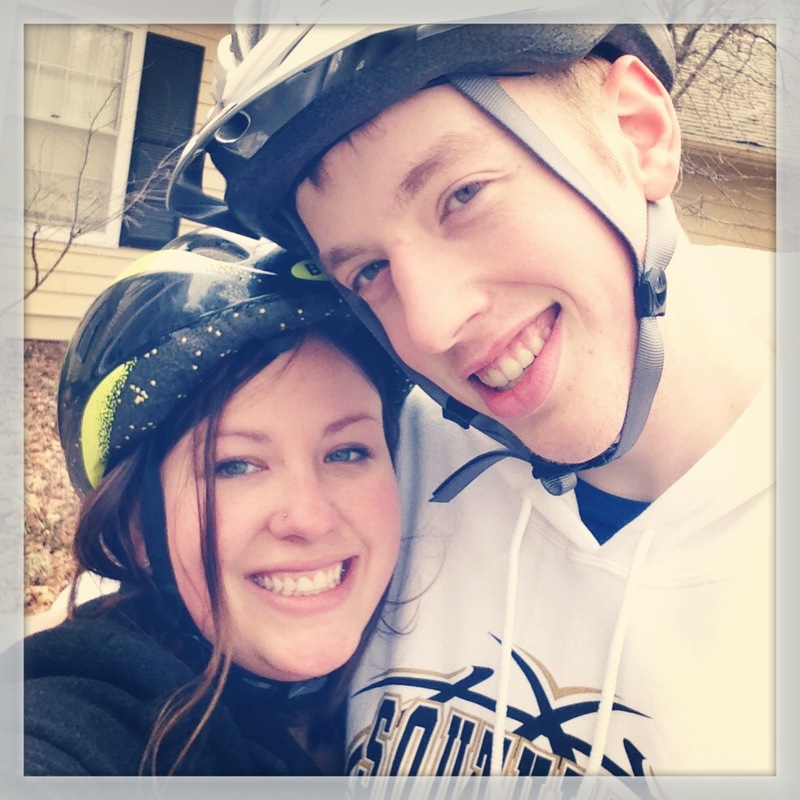 These two people could NOT ride one bike together. Meh. Props for trying. It was worth every laugh. On the way back inside (still laughing), Ben causally mentions he can probably jump over me. Yeah sure Ben. That’s cute. I mean, I know you’ve got long legs, but I’m 5′ 9″. That’s just not possible. And the next second I felt hands on my shoulder and then BAM Ben was on the ground in front of me. So we did it again so that I could have picture proof. The kid is just plain cool. I’m not making this up. 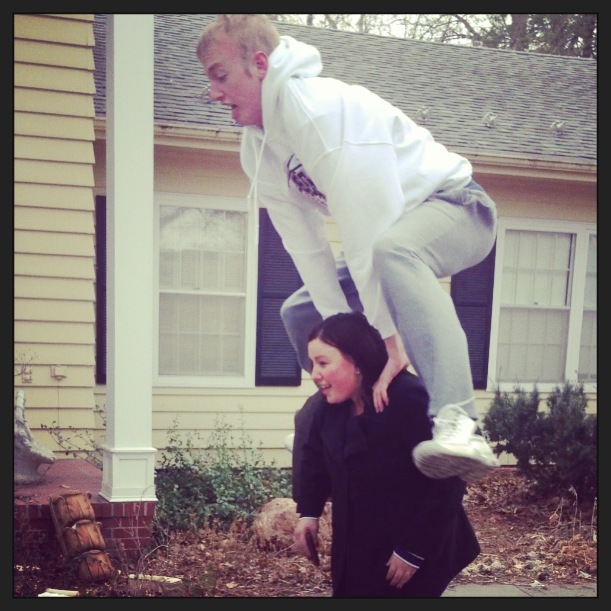 This white kid can jump. 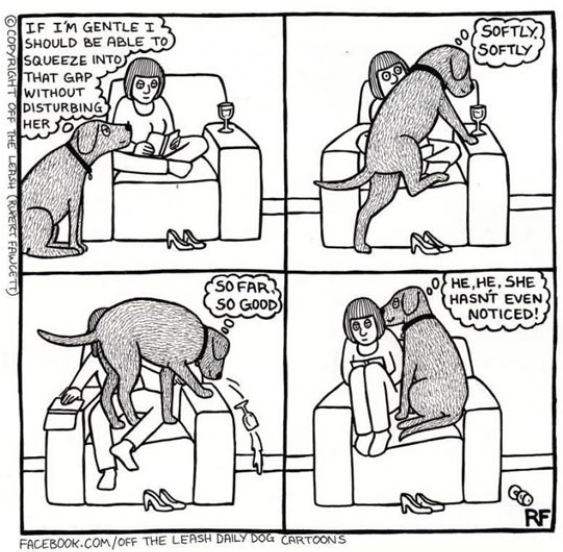 It made me smile… so obviously, I wanted to share with you. This is for any of you who have ever been to my house before. This is a little embarrassing to admit. But I think I’m a sock hoarder. I know everyone talks about the monster that must come in and steal the matches to their socks. But I honestly didn’t think that monster existed. Because I haven’t matched my socks since I moved out of my parent’s house 10 years ago. Sock liberty! Freedom! No one cared if my socks looked nice in the drawer anymore. And frankly, not that many people saw the socks on my feet (and how often do girls wear socks?!) – so who even cared if they matched? Plus, what’s the harm in having a messy sock drawer? Nothing. Until it becomes TWO messy sock drawers. And it’s even worse if you still think you only have one messy sock drawer… and then you open a mystery drawer and realize that that drawer is also full to the brim with socks. That, my friends, is when you have a problem. Which is what I realized last week. I have limited storage. And my extensive t-shirt collection (darn sorority) is already taking up a shameful amount of that valuable drawer space. So I made a goal for April – CLEAN UP YOUR DRAWERS. I thought I’d purged plenty when I had to pack up everything and move states. But apparently I have plenty of room to go still. Yikes. And then I tried to wait. I really did. But those messy socks were taunting me (again, who have I even become?!) and I couldn’t help myself. So late one night, I turned on Beyonce and rocked it hard – while dumping the entire contents of both drawers on my bed. 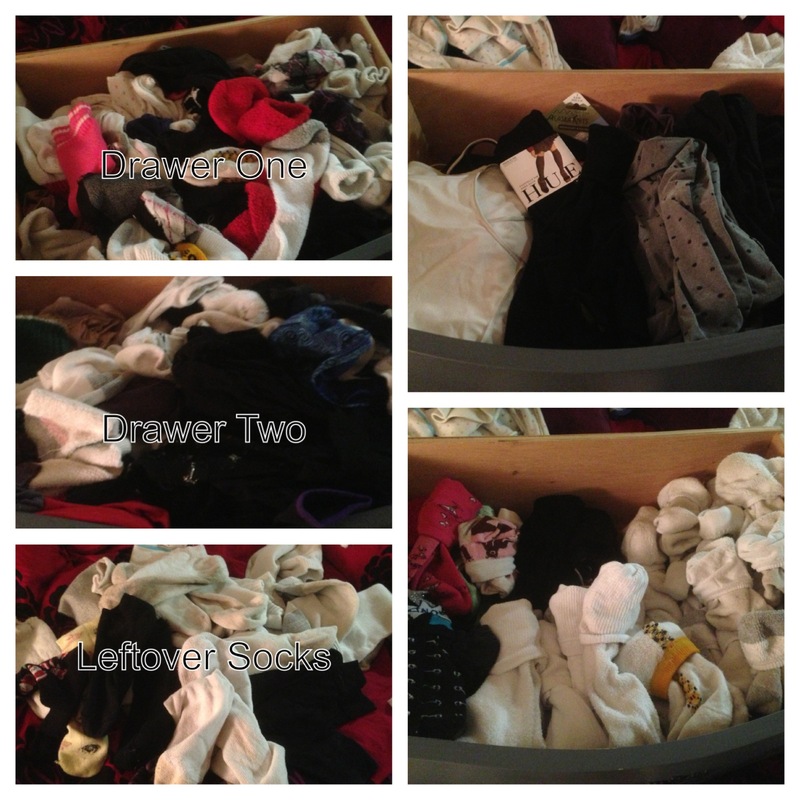 Thank you PicStitch for making it easy to show small glimpses of each drawer in one cute little square picture. I own a disgusting amount of socks. I don’t think I’ve gotten rid of a sock in ten years. And they’ve just multiplied. So I paired all of those socks off. I sorted by color, I sorted by cut… and then I organized my dress socks/tights/leggings/camis in one drawer with all of the the ‘other’ socks in the other drawer. Which yes, still leaves me with two sock drawers… for now. But progress has been made! And now I smile when I open my sock drawer (s). And can we talk about how great it is to just open a drawer and pull out a MATCHING PAIR of socks? It’s incredidble. No more digging until you find two similar looking ankle cut socks. Open drawer. Grab pair. Shut drawer. I went to a work lunch this week. And I had to make small talk. And I finished and I was EXHAUSTED. What?! Since when does that make me exhausted? Apparently since now. I think I’m getting rusty. Noted. Anywho, on the way back, my co-worker and I saw this pull off area for photo taking. And here’s what I’ve learned about Colorado – those areas are TOTALLY worth the two minutes to pull over, jump out of the car and take a picture. Clear beautiful sky, mountains, rock formations and great desert shrubbery. Yeah. Not too bad. The view kills me. It’s stunning. But apparently not stunning enough for me to be respectful… Nope, this girl will absolutely still be 100% cheesetastic for the photo opp. 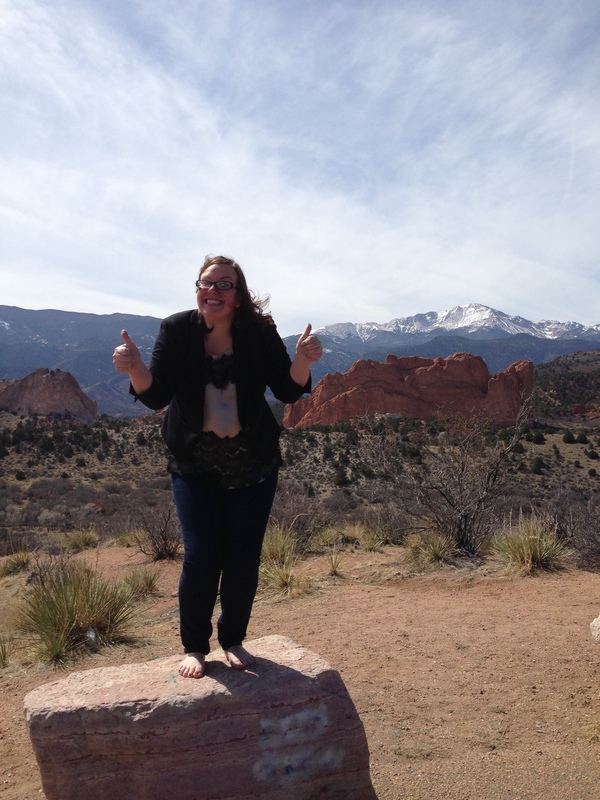 And yes, I did have to remove my heels to climb onto that rock. Oh – and rock climbing in skinny jeans – yeah, I don’t recommend it. Well done Bets. Well done. Wait a tick… Is Selena Back?! This outfit is at Target. There aren’t even the appropriate words for a caption. There’s too much to say. I’m just so sorry it’s blurry. And that it’s not a better picture. So sorry that I found it online at Target for you. Thank you Target for your high quality image. It is a cropped top and a skirt. A CROPPED TOP. Is it just me? Or does that take you back to the catchy tunes of Selena? And then J. Lo’s version of all of the catchy tunes of Selena? 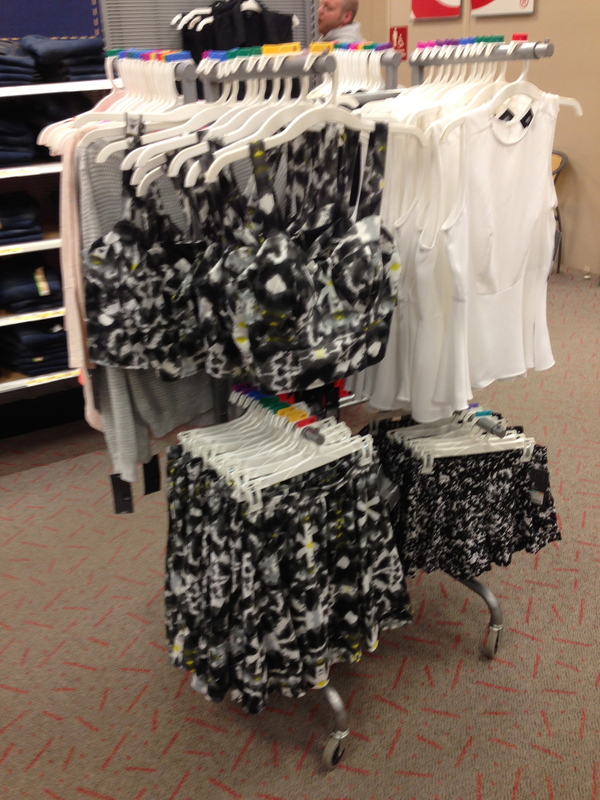 I was so sure it just looked like her… that I Google imaged searched for her picture wearing this Target outfit. Oh no… this is real time people. The cropped look is coming back?! I can’t handle it. It’s not right. Where is the humanity people? And also – totally forgot about this Selena. Who has ruined the search results for the fabulously wonderful and tragic Selena that changed the entire music industry. Pop culture. I can only blame myself. Anywho, after a little research. I finally figured out that the Selena I was ORIGINALLY talking about is Selena Quintanilla-Perez. P.s. If you haven’t seen the movie. It’s amazing. Go rent it. Now. That means, we’ve had a good 20 year run without them. But ladies, apparently, you can expect a return. And if you can pull it off, I highly encourage you to use this outfit to your advantage come Halloween. And then I want to see a picture. Also, I might be having a movie night to watch Selena soon. And then I’ll be jamming to the soundtrack for the next week. Don’t judge me. It’s fantastic. This happened before the ‘Cheese Frenchee Incident of 2013’ but I felt like it was such a win… and the blog could use a little pick-me-up. So I’m going to roll with it and tell you all about it! I made BBQ chicken in a crockpot. It was great. You put a package of chicken in with water, you let it cook for four hours and you take it out, shred it, drain the water and then add BBQ sauce. Keep that sucker on low for another few hours and you have tasty delicious protein for the next week. I had BBQ chicken on an everything bagel. I had BBQ chicken with a side of rice and veggies. And then I had a lot of BBQ chicken left and wanted to make a quick meal. And then it came to me. You know what I love? BBQ chicken pizza. Yes, I’m mainly showing you this image so that you can see my beautiful fabulous wonderful knives. Thank you brothers. 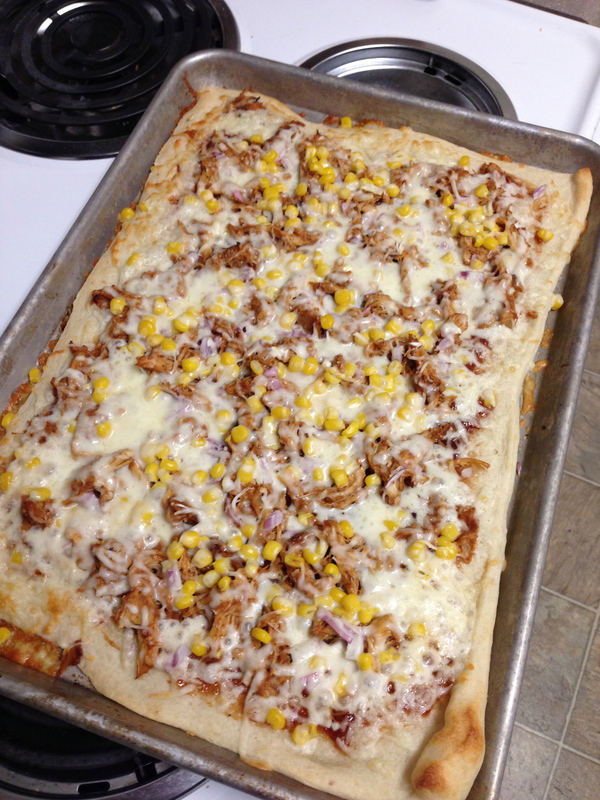 Store bought crust rolled out and pre baked a bit, add a little BBQ sauce as the base, add the chicken, red onion, corn and mozzarella cheese. Also – one large pizza is much too much for one person. Noted. But it does make for excellent leftovers. And writing all of this out gives me a wee bit more faith in myself. I’m good with the oven. I can handle the oven. I’ll just stick with that. Maybe we’ll try the stove top again in 2014. Maybe. This made me laugh. 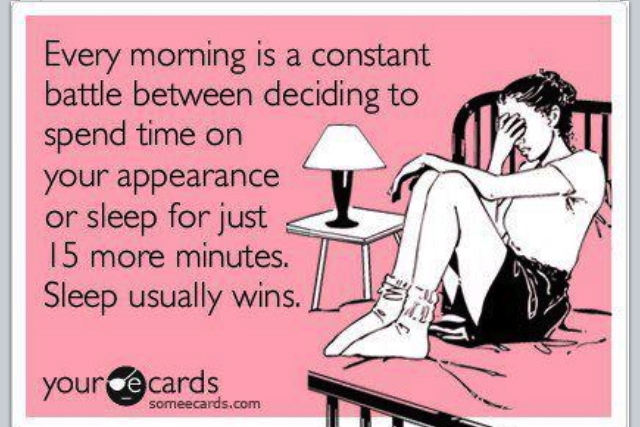 Especially following a really really tough adjustment week because of that dang daylight savings time jump. And felt right following a “hey I almost torched my apartment on accident” post. Well kids, this is going to start off like any other blog post. And then it’s going to go wrong. It all started when I mentioned the cheese frenchee at work and I got the blank stares. Again. I’d found yet another thing that simply wasn’t a thing outside of Nebraska. And as I described the concept of a grilled cheese that was filled with mayo, bathed in batter, coated in Ritz crackers and then fried… I realized it was a something that people just had to try to love. Which, was fine, because this girl knows how to cook. Bring it on cheese frenchee. So I research recipes for both and I find ones that look easy and promising. And so begins. 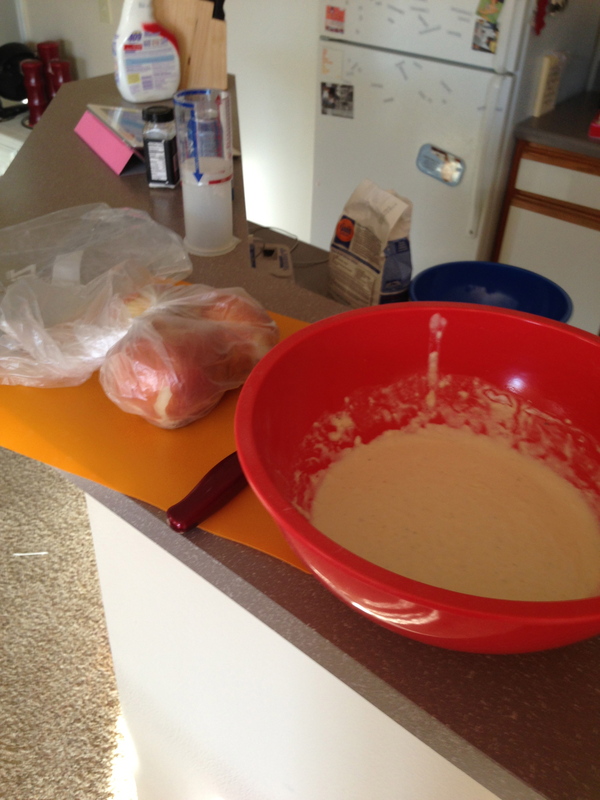 Batter made for onion rings…which is supposed to take an hour to set (really?!). Onions. Check. Batter ready. Check. Then I turn to the main dish. 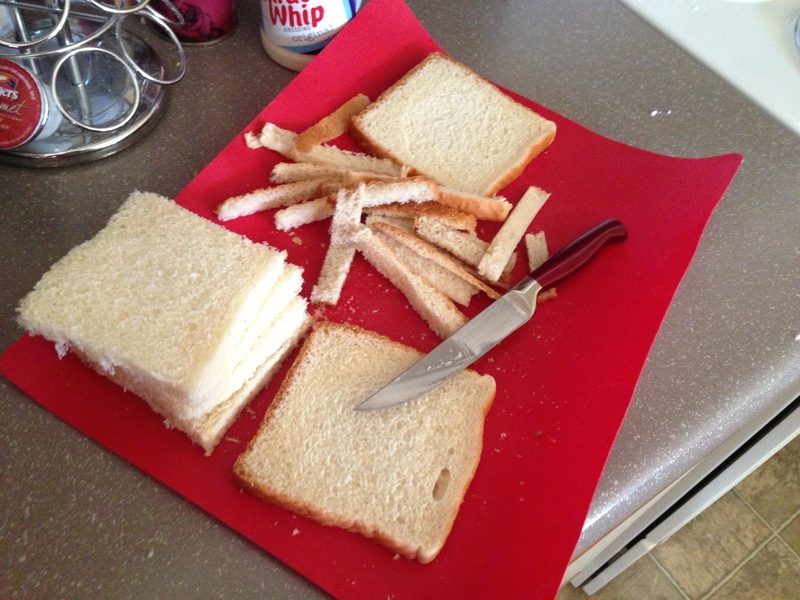 Crusts cut off. Cheese added. Just think of the headache saved if I would have just quit here and stuck with good old fashion grilled cheese. And then this is where the evening took a turn. I had already opened the windows and doors because it was gorgeous outside (thank you LORD), but I noticed a smoke smell. Coming from the pot on the stove. The pot filled with an entire carton of oil. Not a skillet. No, I had elected for a giant spaghetti pot. Because I had heard that would work and that seemed genius. 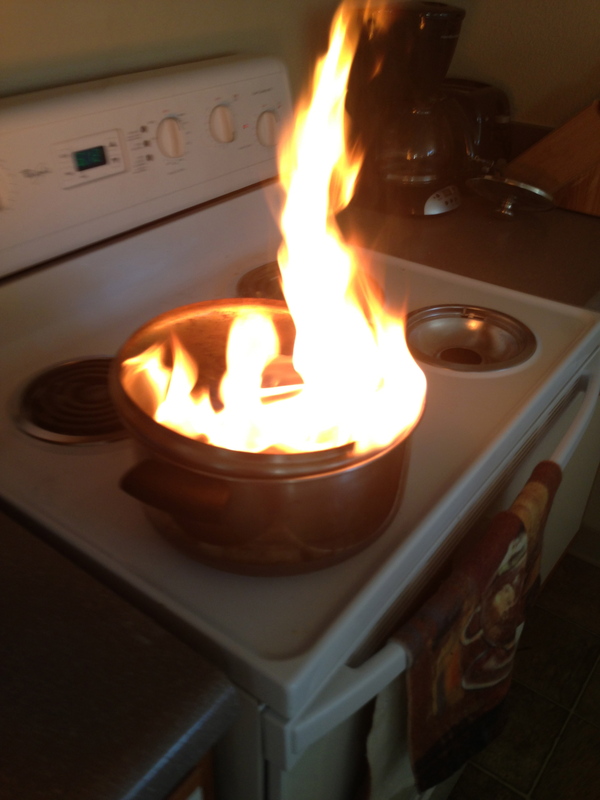 So I opened the lid of the pot… and then there was fire. Lots of fire. Yes I took a picture. The camera was right there. And if my apartment is about to burn down, I’m documenting it. I was in a panic people. Bear with me. 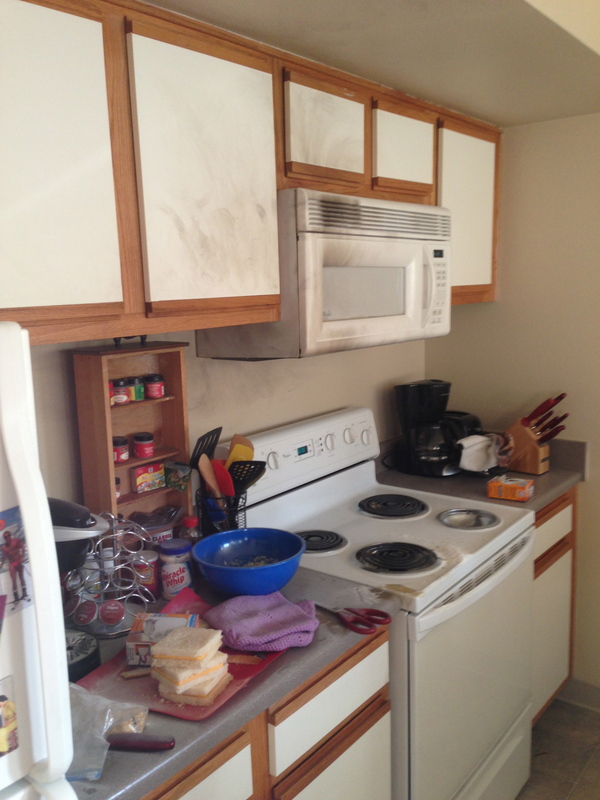 Yes, that’s the lid sitting in the pot, completely engulfed in the flames. In my mind I think “grease fire don’t use water” and baking soda swam into my mind. Instincts are a funny thing aren’t they? I ran and grabbed the box from the cat litter box (who is making fun of the cat lady now?!) ripped it open and poured it on. Which made the flames instantly grow. And then die a little. So I ran back, grabbed another box and then dumped it on. Which again, made it grow, maybe destroying the microwave…and then die down. At which point I found my pot holders, grabbed the pan and RAN outside with it. Which is, yes, when I burned my hand (only a little everyone – it’s nothing worse than a curling iron burn – don’t panic). Eventually (much much later) the pan fire stopped. I mean, do you even try to save the pan at this point? The smoke alarms are going off. The pets are in a panic. BUT MY APARTMENT IS NOT ON FIRE. I immediately shut the pets in my room. Prop the doors wide open and rush to fan some of the smoke out. And look at the damage. It’s just smoke on the cupboards. They are fine. The microwave on the other hand. Is not good. There was baking soda everywhere. Absolutely everywhere. But you know what? There wasn’t fire. And I learned a valuable lesson: I will never fry anything ever again. And honestly, it might take me awhile to cook again. So I’m here to tell you: DON’T DO THAT. Oil gets hot. Super hot. And self combusts. And as the smoke filtered out and the alarm stopped sounding… my friends arrived. And they helped me clean up. And they gave me hugs. And they laughed with me as I recounted the story in hysterics (I blame the adrenaline). And then they took me out for dinner. Because they are great. I thought about skipping this post. About not telling you about this. But I decided this was part of the adventure of blogging. Telling you my failures and letting you learn from them. Because if I can save you one big and massive oil fire on your store. I will totally take that one for the team. I don’t wish that fear upon anyone. Also, it’s pretty therapeutic to blog about it. So with that. Be expecting my next blog posts to be all about baking. Because baking? Yeah, there’s no fire involved in that. And yes, I will absolutely be thanking God tonight for all of my blessings today. And tomorrow. And every day after that. **Update: Here’s something my fabulous Aunt Di shared with me that I’d like to share with you in case you want to try this at home! Don’t ever cover hot oil. 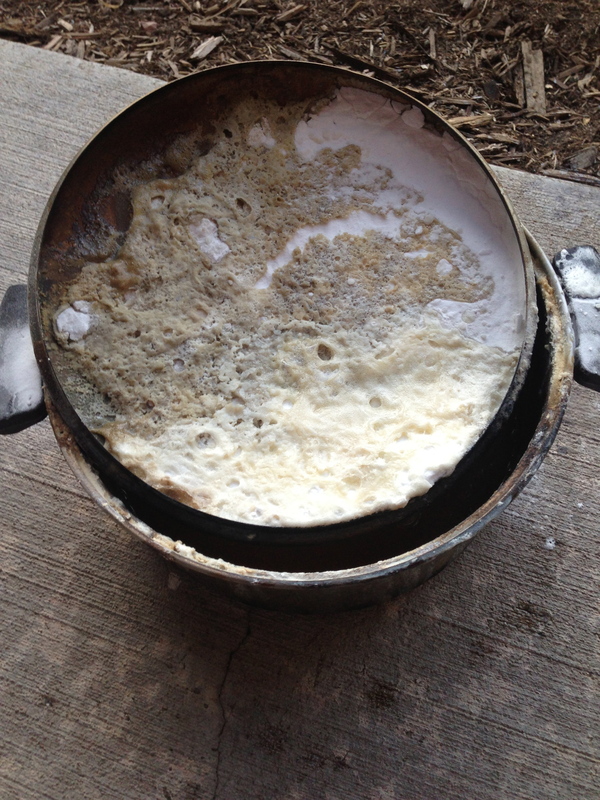 Any steam trapped in the pot could cause oil vapor/droplets to catch fire. Even if you’re frying in a pan with oil, don’t cover it with a solid cover–the steam or water from the food can cause the same eruption. Regulate the temperature. You can do this with an electric frying pan/pot that will do this automatically but, if you don’t want to spend the extra cash money, just get a good thermometer to monitor the temp of the oil. And keep an eye on it. Have a fire extinguisher for the kitchen. It can’t hurt to have it tucked away in the corner where you can grab it if need it. Plus, once you get one, you will never need it! Right?! Yesterday I baked a cake for the Lenten Challenge. Do we know how easy it is to bake a cake? You just follow a box. 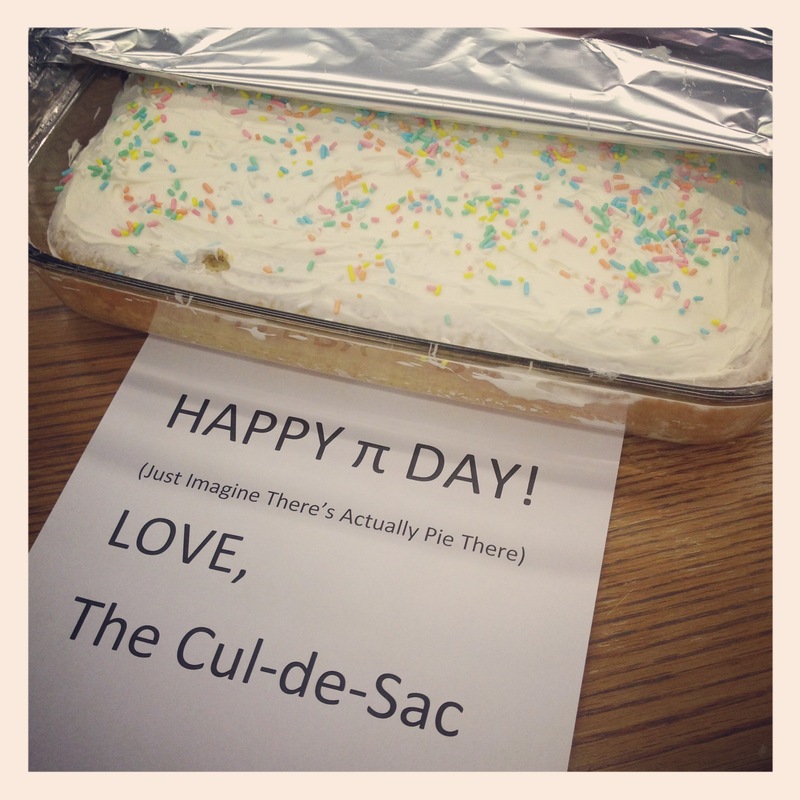 But I brought it into work today anyway (it was that or eat the entire cake myself… and hey… sharing is caring). I’d like to think I’m clever. And guess what. It must not have been terrible. Because the whole thing was gone by 5:00pm.